AGENCIES, MUMBAI: They have tried in the past and both failed, so when Bengaluru FC and FC Goa clash in the finale of the Indian Super League at the Mumbai Football Arena on Sunday, sparks will fly. The two best teams in the league have made it so far on merit. They have qualified for the final in the past; Bengaluru as early as last year when they lost to Chennaiyin FC, and the same opponent crushed Goan dreams in 2015. On Sunday, Bengaluru FC, who topped the league stage, start as the favourites in this titanic tie. But they will need to be wary of a dangerous Goa side who thrashed Mumbai City 5-2 on aggregate to progress to the summit clash. Bengaluru have a balanced squad which fired collectively. After going 11 games unbeaten in the first half of the campaign, they did go through a rough patch of form. But the team worked together to overcome those challenges and reach their second successive ISL final. Goa, meanwhile, have been prolific in front goal, scoring 41 goals so far in the competition. Sergio Lobera has also worked out a solution to Gaurs’ frailties at the back, making them a more balanced side. However, Goa have come a cropper whenever they have faced Bengaluru FC, losing both matches and conceding five goals this season. This psychological advantage, along with a superior Indian contingent and tactical flexibility, hands Bengaluru the edge in Sunday's battle. As Cuadrat acknowledged, Goa won't be pushovers by any means. They have match-winners like Ferran Corominas, who is at the top of the goalscoring chart with 16 goals from 19 games. Supplying him in plenty are the likes of Hugo Boumous and Edu Bedia, who have impressed as part of a well-bonded, tightly-knit, aggressive unit. The centre-back pairing of Carlos Pena and Mourtada Fall have bailed Goa out more than once this season. And once Goa get into their attacking groove, it is very hard to stop them. However, Bengaluru have been a tough nut to crack for Sergio Lobera. While the Blues had a closely-fought contest in the playoffs, Goa wrapped it up in the first leg with a thumping 5-1 win against Mumbai City. 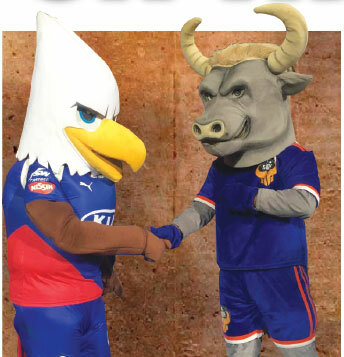 However, with two of the league’s most attacking teams locking horns, the final fixture of the Hero ISL season promises plenty of goals, fun and drama.